If you want to understand how someone thinks your product works, give them a pencil and ask them to draw you a diagram. A simple sketch can transport you inside someone else’s head better than any other product research technique. Sketching is awesome at helping us construct new ideas and communicate them to others. It’s no coincidence that many product designers’ software of choice for constructing their ideas is called “Sketch”. This post is not about that type of Sketch. This post is about a really overlooked aspect of sketching. Sketching is an amazing technique to deconstruct the way another person thinks about how something works, more commonly known as their mental model. As a product researcher, it’s my job to understand how people think about things, and that’s why I’m excited about the power of sketching as a means of deconstructing what’s in someone’s head. I delivered a talk on the power of sketch research at the Inside Intercom world tour earlier this year. The video and slides are embedded below. Scroll down to read more about how you can apply sketch research to your own product. It turns out that psychologists have been using sketching as a window into people’s minds for years, from the House Tree Person test to evaluate intelligence and brain damage, to art therapy with young children who have experienced trauma. Sketches can be very simple and lo-fidelity but communicate a huge amount of important information about how someone feels and thinks about something. They can even communicate feelings and traumatic experiences that go beyond the language of the person drawing. If you want to design amazing products that feel intuitive to your users, you first have to understand how the users of your product think. So the fact that a sketch can take you right inside someone else’s mind means it can be a really useful product research technique. When you understand how your users think and what their mental models are, then you’re better placed to design something that feels really intuitive for them. Back in 2008, I was leading user research for Google mobile search. The iPhone hadn’t been around for long (it launched in June 2007) and local search on mobile was a very nascent product. One of the common assumptions back then was that raw physical distance between the mobile search user and the local place they were searching for (e.g. dry cleaner) would be pivotal to how users selected which dry cleaner to go to from a list of local results. To understand how people thought about local search information, I first wanted to understand how people thought about their “local” area; the familiar places they went to most and the places they were most interested in seeking new information about. So I got people who owned iPhones to draw simple sketch maps of the places they went in a typical week and got them to talk me through their maps. Some interesting patterns started to emerge. One common trend was that many people in the study moved around their local environment in a kind of “dog bone” pattern. At one end of the dog bone there was home, at the other end was work, and the distance in between was their commute. The places they were interested in going to shop, eat, and run errands, were heavily focused within their dog bone zone. Unlike the assumptions of many of the team, the users spent very little time exploring other places. Like other mammals, they stuck to well trodden paths. They were not nearly as adventurous as was assumed. Rather than being interested in local information based on a circular zone around them, people were more interested in discovering new places, or retrieving information about known places, that were located within their local dog bone zone instead. Once you understand how people think about their local environment and relate to things in it, you can make your local products better for them. In the years that followed, for example, Google launched a feature that allows you to save Home and Work locations. This makes getting directions and commute information for your “dog bone” much faster. You can also search along the route that you’ve asked Google Mobile Maps directions for, so you can run errands more conveniently along your route. His research revealed that unlike the dominant Facebook model at the time, people didn’t have one big, equal group of “friends”. Instead they have many different circles of friends in real life and wanted their online social tools to support those different groups. This had huge implications for social products, sharing models, and privacy. Google designed G+ Circles based on this insight. 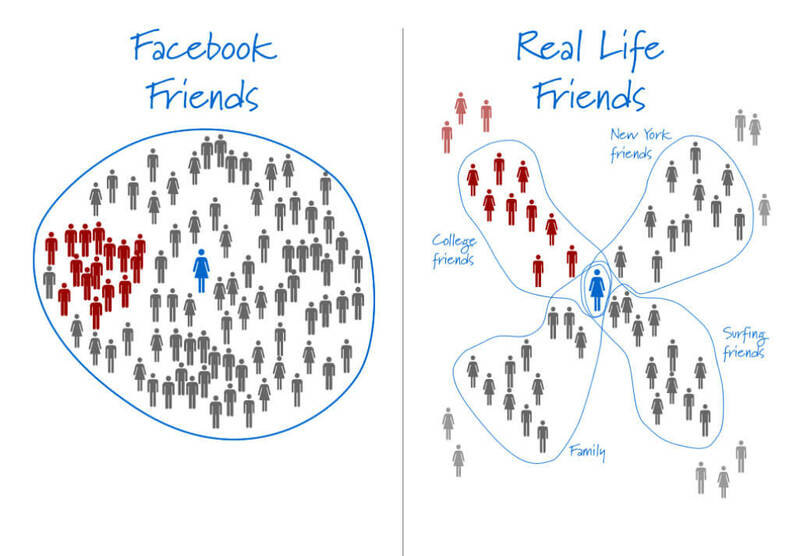 Facebook redesigned their Groups product to support more categorization of friends. It’s easy to look back at these old examples and think it must have been obvious, but these insights would have taken a lot longer to reach without the sketches. We strive for simplicity when we design every aspect of Intercom. But behind that simplicity is a lot of complexity. We used sketch research with our coworkers to understand how people at Intercom thought about how Intercom works as a system. We had noticed we weren’t always using the same terminology to describe our product, and this was creating some confusion internally. We decided to conduct internal research to find out what our coworkers’ mental models of Intercom were. We didn’t have a common mental model of Intercom. So the Research team interviewed our coworkers and asked them that simple question: “How do you describe how Intercom works?”. We got them to draw this on a sheet of paper and talk us through it. What we found was not only were we using different terminology, but we were thinking about the product in entirely different ways. We realized we didn’t have a common mental model of Intercom, meaning we weren’t explaining how it worked in the same way. The diversity of these drawings was a catalyst for us, prompting us to create a clear system model of how Intercom actually works. This will ensure that everyone at Intercom can get on the same page, and make sure when we onboard new employees they are thinking about Intercom as a system in the same way too. Next, you need to write a few clear, open-ended questions that will prompt your research participant to start sketching something relevant for you. Intro: I am interested in understanding how you think about different types of food. These days there are so many different messages in the media about which foods are healthy and unhealthy. I really want to understand what you think. Starter question: I’d like you to draw me a map of healthy and unhealthy food. Draw some examples of very healthy food on the far left and very unhealthy food on the far right. How about some examples of food that are more in the middle? Neither very healthy or unhealthy? Can you draw some of those? Are there any foods that you’re unsure about? Give me some examples? Where would you put those on the map? Is there any food here that you think is controversial? Examples of food that you’ve heard mixed messages about in the media? Now how about your personal favorite foods? Can you circle those for me? Remember to ask clarifying questions too, so you’re really clear what someone’s scribbles mean and can read any text they write when you look back on it later. It’s important to talk to people who are relevant to product area you’re researching. If you’re researching how people think about buying a car, you should make sure you talk to people that have actually bought a car, and who did so recently enough that they can remember details of the process they went through. Make sure you interview people individually rather than in a group. You’ll be able to give them more prompting and encouragement, and ask clarifying questions, which should lead to more valuable insights. Otherwise you might end up with a bunch of sketches that make no sense 🙂 . This is really easy to overlook. It’s highly likely that the people you’re interviewing will not be professional artists. They may be very self conscious about their awful drawing skills, so you’ll have to spend time putting them at ease. Having a variety of materials for them to draw with helps; some people prefer pencils while other feel more confident with a big fat Sharpie. Have a few erasers handy for perfectionist participants. Make sure there’s a big stack of paper available too so they don’t feel pressure to get it right first time. If they want to start over, no worries! Let them. Finally, remember to encourage people! Be warm and friendly and reassure them that they’re doing a great job. Reassure them that the goal is to help them show you how they think about X, not to create fine art. Sketching is a really powerful technique that can help you understand how your users think, enabling you to deconstruct their mental models. It’s quick, cheap and fun. It’s a particularly useful research technique if you want to understand how your users think about their relationships with other people, physical space, sequences of actions, or complex systems. Hopefully this post gives you the confidence to go try it out for yourself. Let us know how you get on! Thanks to Jillian Wells, one of our Senior Product Researchers, for contributing to this post.